All titles available at Portland Button Works website and Etsy shop. 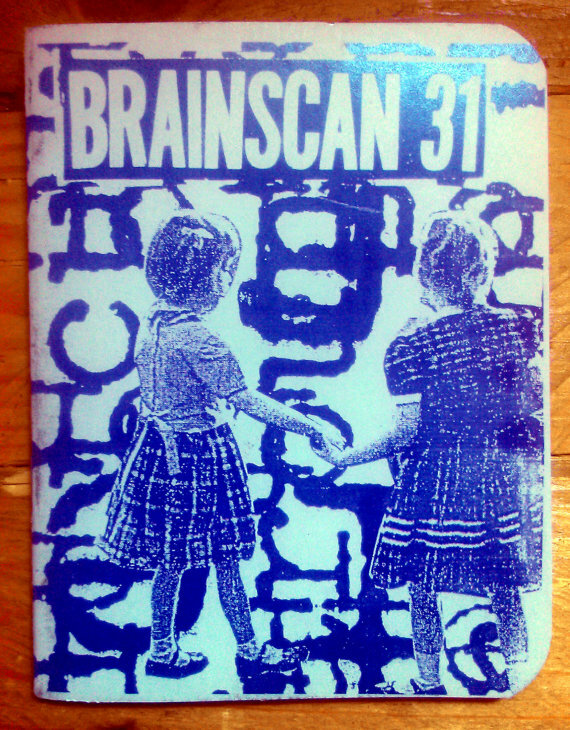 email alex at brainscanzineATgmailDOTcom for wholesale pricing. This 10″ record has 7 pop-punk songs about zines, a zine filled with lyrics, stories, lists, and more. Plus, a download code to get the album digitally that includes Copy Scam Live At Leeds (Zine Fest). 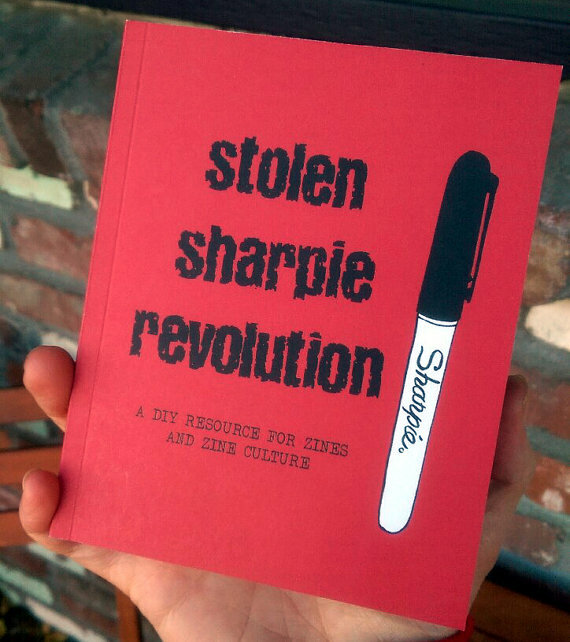 “The Copy Scams are a the band equivalent to a 24 hour zine! Steve was visiting Portland from the UK and thought it might be fun to start a band while he was in the US. While he was in Portland he lived in a closet in the basement of the Spiral house and tricked housemates Alex, Paul and Marc to form a band in three weeks before the 2010 Portland Zine Symposium. 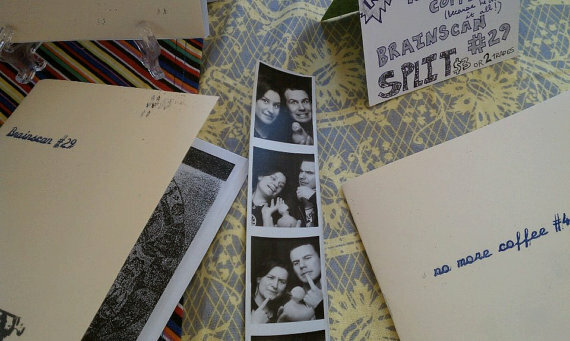 The decided to be a zine themed bank and In those three weeks they wrote 4 songs about zines, practiced, made a lo-fi recording, then played a show to end the Portland Zine Symposium weekend. Giz missed the show because he had to fly back to France so he convinced them they needed him as a second guitarist and that they needed to do a UK tour. Steve wrote more riffs and 3 more songs were written with the help of the internet. In the autumn of 2012 Alex, Paul, and Marc flew over to the UK from the US and Giz came over from France where they sorted out the new songs and recorded them and re-recorded the old ones then played a couple shows before going their separate ways again. 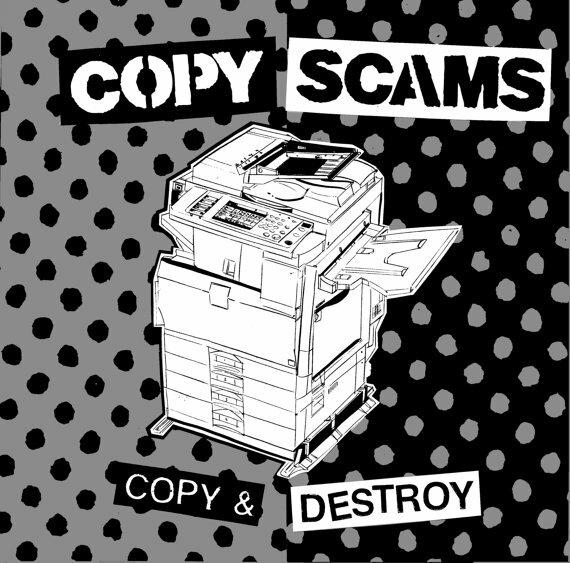 The Copy Scams – Copy & destroy 10″ vinyl record, zine, and digital download code. available here in the US, here in the UK, here in France. You can listen free online, but you don’t get the cool zine and other stuff that come with the vinyl. This zine was completed for the 2014 Chicago Zine Fest. It explores the concept of family, growing up and into ourselves and making our own home. I reflect on the years I have lived here and how me and the city of Portland have changed over the past 15 years and how running a brick and mortar shop that sells zines fits into that. This zine started to be about how awesome 2012 was going to be until the end of my year was almost ruined. I started the zine with the realization that I had grown 2 inch in my 30s somehow and how growing older is great because you get to grow more into yourself, even if you didn’t know what you wanted to be when you grew up. I wrote a bit about growing up non-Mormon in Utah. I also write about how I am uncomfortable teaching and how maybe some people just aren’t meant to teach just like not everyone is meant to be self employed. Due to a lot of circumstances and privileges in my life I am able to have a lot of adventures. Some of them are travel related and others are ridiculous projects I have been able to be a part of. In retrospect I outline some of my adventures fro each year starting in 2008. Some of the projects have included: traveling to France and the UK, traveling the east coast alone, going on a US zine tour with friends from the UK, attending lots of zine fests, starting a zine themed band called The Copy Scams, touring with the Copy Scams, starting a website for Stolen Sharpie Revolution, and starting a brick and mortar zine distro and button shop called Portland Button Works. The end of the zine wraps up with the how my business partner left Portland and left me a giant mess to clean up when I got back from a long planned trip to the UK. But, I prevailed and overcame and now the distro and shop are stronger and better for it.